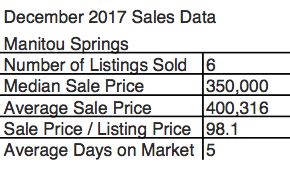 Click here to view historic sales data for Manitou Springs. Scroll down to view the latest listings in Manitou Springs. A scenic mountain backdrop and a small-town feel both make Manitou Springs one of El Paso County’s most desirable residential areas. 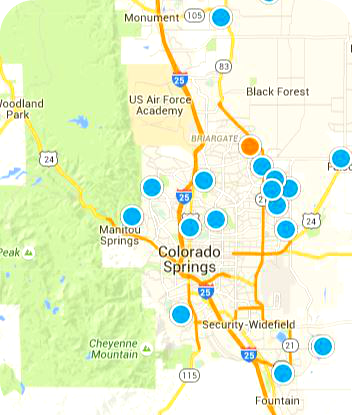 Nestled in the foothills of Pikes Peak, Manitou residents enjoy convenient travel access to all of Southern Colorado. Highway 24 passes over Manitou Avenue, leading west to Woodland Park and all of the beauty that the Rocky Mountains have to offer. Interstate 25 is just a few minutes east of the city, while a short drive on Colorado Avenue leads through Old Colorado City and into the heart of downtown Colorado Springs. Everyone will find something to satisfy their interests in and around Manitou Springs. Gift shops, art galleries, and natural mineral springs line the historic district along Manitou Avenue. The Manitou Brewing Company and a host of other casual restaurants offer food for every taste, while fine dining options abound, including the Mona Lisa Fondue Restaurant, the Briarhurst Manor Estate, and the Cliff House. The Penny Arcade sits at the heart of it all, furnishing classic games of skill and modern arcade cabinets for every entertainment need. For the more adventurous, the Cave of the Winds features a variety of underground tours for the whole family, and the Manitou Cliff Dwellings paint a picture of Colorado from the days of the ancient Anasazi. Outdoor sightseeing continues in Garden of the Gods where the state’s natural beauty can be experienced through rock climbing, mountain biking, or just a casual stroll. All of the magnificence of the Front Range can be seen altogether from the top of the Manitou Incline. However, the summit of Pikes Peak holds the best view of the area and can be reached through a drive up the Pikes Peak Highway, a hike up Barr Trail, or a ride on the Pikes Peak Cog Railway. Local traditions and world-famous events keep life exciting year-round in Manitou Springs. The summer kicks off with the Manitou Springs Wine Festival where visitors can enjoy tastings from thirty Colorado Wineries. Festivities continue through July with the Pikes Peak International Hill Climb, one of the oldest motor sports races in the United States. The Pikes Peak Marathon, held annually at the end of the summer, starts in Manitou and features both half and full marathons. The Emma Crawford Memorial Coffin Race and local ghost tours spice up the autumn months, while the Great Fruitcake Toss helps to alleviate any post-holiday blues in January. Valentine’s Day lunch can be spent at the Mumbo Jumbo Gumbo Cook-Off, followed later in the day by the Carnivale Parade held downtown. With over two dozen other events planned each year, there is always something to look forward to while living in Manitou. The City of Manitou Springs also offers a local library, pool and fitness center, and residential parking program. The award-winning School District 14 serves the youth of Manitou through two elementary schools, Manitou Springs Middle School, and Manitou Springs High School. Each week, the Manitou Springs City Council holds either regular meetings or work sessions, all of which are open to the public. Other city services include free shuttle rides, quarterly newsletters, and a unified trash and recycling package.